Now, to recruit more consumers and property owners to its cause, the brand is making a splash with new “Too Smart to Waste” positioning and a bold campaign staking its claim as the toilet for smart*sses. 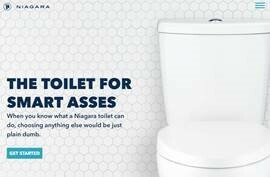 Since a Niagara toilet delivers a powerful flush by using science, and not stupid amounts of water, the campaign showcases that installing one can be one of the smartest (and easiest) decisions people make for their home and the planet. • And, in a time where communities around the world are bracing for drought, it’s never been more essential to get smart about water consumption. • In fact, just last year, the UN warned that by 2050, global demand for fresh water is projected to grow by more than 40 percent. Throughout a series of videos (you can find them all here) featuring a loveable average Joe named, well, Phil, and a digital advertising campaign, Niagara hopes to show people how seamless it is to save water every single day.